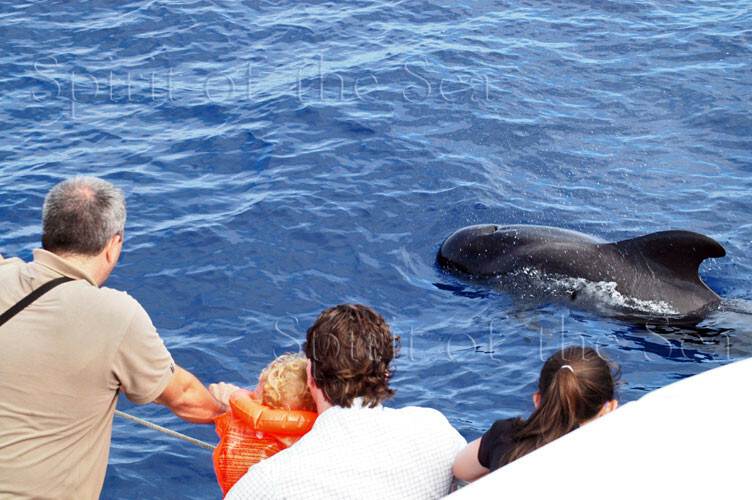 Spirit of the sea is a purpose built dolphin and whale search catamaran with a capacity for 97 passengers. 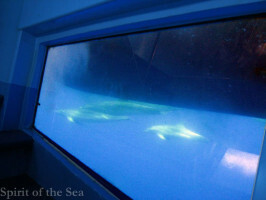 There is also a large glass bottom in both keels giving the opportunity to view life below the ocean wave. 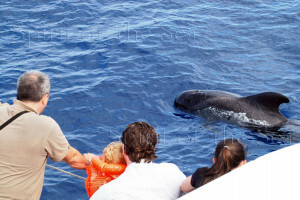 Over one third of the varieties of dolphins and whales in the world can be seen in the waters of Gran Canaria. There are a great diversity of cetaceans and other sea creatures, such as turtles, flying fish and the illusive whale. Here is one of the few places in the world where it is possible to experience this. Protection of the environment is very important to us. For this reason we actively collaborate with universities and local scientific people who use the boat as a base for their studies. We assist with photographic identification and the recording of factual data of the day-to- day activities of the dolphins and whales in their wild environment. Spirit of the sea sails from Puerto Rico along the southwest coast of the island in search of dolphins and whales in their natural habitat. The crew are multi –lingual and ensure everyone is kept up to date with sightings. Throughout the journey people are free to move around the boat. There is a toilet on board. The trips are either 2 or 3 hour. 3hr trips are Monday, Wednesday, Friday and Sundayat 10am and 1.30pm. Sundays, only in summer season. The only difference between the 2 and 3 hours trip is that the 3 hours allows time for a swim stop in a sheltered bay and to feed the fish. 97% of the time we see dolphins or whales! If we do not encounter either of them during the trip all passengers are given a second sailing ticket free of charge to come on the boat again at their convenience. This is our cetaceans guarantee. Those customers who require transport just pay for this directly at the harbour. It is 6 € per adult or child. Unlimited soft drinks are also included in the ticket price. Beer and snacks are available to purchase on board. Call reservations from 9am to 8pm 928 562229. Bookings can be taken up until 8pm for the following day. Transport is available from all resorts - see pick up sheet for your nearest pick up point and time. If in doubt call reservations who will be happy to assist. Remember Spirit sails every day except Sundays although you can call and make bookings every day. We recommend that you telephone bookings whilst customers are with you to ensure that their preferred sailing is available. Please advise customers to bring a camera and suntan lotion. For those on the 3hr trip remember to tell them to bring swimwear and a beach towel. This is an opportunity to see dolphins in their natural habitat, which means that every sailing is different and the experience unique. As you will be seeing dolphins in their wild environment all photographs will be natural, individual and not staged. The different sailing times and frequency means customers can choose what they prefer, be it a 2 or 3 hr trip, morning or afternoon. An opportunity to see the southwest coast of the island and take some sun at the same time. For those customers wanting to go out on a boat but not spend a whole day Spirit of the Sea provides the perfect solution.